Other Stars: Lloyd Bochner, Robby Benson, Robert Costanzo, Jim Cummings, Mark Hamill, Bob Hastings, Ingrid Oliu, Ron Perlman, Efrem Zimbalist Jr. It has been nearly 15 years since Tim Burton's Batman became a box-office smash, and comic book nuts are still waiting for their faithful cinematic adaptation. Sounds like a job for Bruce Timm and Paul Dini, the most prominent members of the writing team behind Batman: The Animated Series, the only filmed Batman that successfully recreates the tone and feel of the classic comics. The series has a faithful fan following, and Warner Brothers has finally started releasing it on DVD, albeit very slowly (the first volume, containing five episodes, was released nearly a year ago). 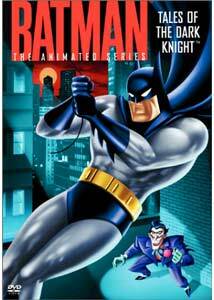 The high quality animation, which reinterprets the look of the Caped Crusader and places him in a Gotham City that's an odd amalgamation of historical eras (cars and dress from the 1930s, technology from the 1990s and beyond), comes across quite nicely on DVD, though in these early shows, the series is still struggling to find the right tone. In The Underdwellers, Batman comes to the aid of a group of runaways who are being controlled by a man who has convinced them they are worthless. In P.O.V., the focus is taken off Batman and placed on a cop and her rookie partner when the two must explain what happened after a botched sting operation. In The Forgotten, Bruce Wayne infiltrate a camp of homeless people, only to be hit on the head and lose the memory of his riches�and his alter ego. Finally, the Joker makes an appearance in Be a Clown when he terrorizes children at an amusement park. Like any series, Batman: TAS suffered from some growing pains, and therein lies the problem. This disc collects four episodes from very early in the series' production, and they are some of the worst of the 85 episode run. The plots meander, the villains are forgettable and ineffective. Even the Joker, whose episodes are usually a high point, is misused. Children figure largely into the plots of two of the episodes, and that gives them an unmistakable "kiddie" feel. I applaud Warner Bros for releasing the series in production order, but including so few episodes per disc really draws attention to the show's uneven start. On the other hand, it is nice to have any Batman: TAS on DVD at all. With the feature film series unable to get back off the ground after the disastrous Joel Schumacher era, the animated series and its spin-offs Gotham Knights and Batman Beyond offer the best chance for Batfans to get their Batfix. Image Transfer Review: These images look miles better than they did in their original TV airings. I always had a problem watching the show on TV because it was so dark�the consistent shadow detail and rich blacks on this disc make the viewing experience a lot more pleasurable. Colors accurately represent the series' intended muted, noir tone, and the image is crisp and free of grain and blemishes throughout. Audio Transfer Review: The audio mix isn't bad, but it's nothing special, either. Considering the age of the material, and the fact that it was a TV show, it's actually fairly good. Audio is confined to the front soundstage, with clear dialogue and a nice presentation of the score. Some more directionality would be nice, or surround support for the score, but the mix gets the job done. Extras Review: Each episode includes a short video introduction from series' producer Bruce Timm. His comments seem to be pretty general, and he tends to mention bits of episodes not included on this disc (like the one that introduced the villain Two-Face). Voices of Gotham City is an interesting piece on Batman's vocal cast that unfortunately only runs for about six minutes. We hear a bit about how hard it was to find the voice of Bruce Wayne, and voice director Andrea Romano and Batman himself, Kevin Conroy, get in a few brief comments. Conroy is scary looking. "The Line Up" is a simple click-the-remote gang requiring you to choose the correct villain out of a line-up. While I'm sure most fans are happy that Warner Bros is bothering to release Batman: The Animated Series at all, I'm sure there are better ways of going about it. Like, say, releasing more than four episodes per disc (at this rate, the series will run 20 volumes, not counting the spin-offs). It's tough to recommend this one on its own merits�the collection of episodes is pretty weak�but fans will probably want to pick it up, if only as a vote of confidence that more are coming soon.